"I value his opinions about my health care needs and he is very receptive." "I find him to be knowledgeable, thorough, and caring." "Dr. Brendan is very knowledgable and up to date on medications, procedures and the like." 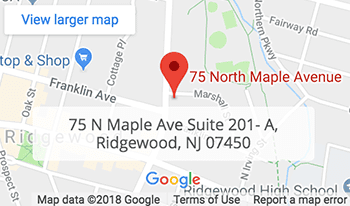 "Extremely professional, Friendly, intelligent, careful, and good diagnostician..."
"Incredibly personable, attentive, knowledgeable, caring and available." 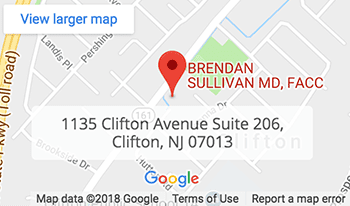 Brendan Sullivan, MD, FACC, is an experienced cardiologist and internal medicine physician who offers personalized health care at his self-titled practice in Clifton and Ridgewood, New Jersey. Dr. Sullivan completed his undergraduate and master’s degrees at Georgetown University in Washington, D.C. He went on to pursue his medical studies at St. George’s University School of Medicine. After receiving his medical degree, Dr. Sullivan continued his training through an internal medicine residency at St. Luke’s-Roosevelt Hospital Center in New York City. He then completed a cardiology fellowship at Albany Medical Center in Albany, New York. As a triple board-certified doctor and cardiologist, Dr. Sullivan has provided the highest quality medical care in the region for more than 14 years. At his practice, Dr. Sullivan has served generations of families in a friendly environment, where the health of his patients is his top priority. Dr. Sullivan is currently accepting patients at his family-oriented practice, which specializes in cardiovascular disease prevention. We are your testing center for cardiovascular diseases and illnesses. For more information regarding your insurance coverage please call our office! If your insurance is not listed please feel free to contact our office!